I’m currently reading it. It’s mind blowing to see that there were peoples in Americas further than 13k years ago. For those looking to read it, make sure to get the 400-some page version of this book. There is a similarly named book aimed at grade school kids. This article is full of misconceptions. Let's address a few of the most egregious ones. >there are billions of stars and planets in our galaxy and billions of galaxies. Humans are rather bad at fully understanding such large numbers. There's no obstacle to working with large numbers once you understand powers and logarithms (i.e. pre-calc). Very smart people have looked at the Drake equation and it yields a very wide range of values . The main reason Europeans were able to take over America was disease. The Aztec effort to kick out the Spanish was hampered by smallpox , and colonization of North America had to wait for over a century before the native population was sufficiently depleted by disease to stop offering resistance. Needless to say, disease worked unintentionally and because both sides were the same species. > So, screw it, all movie alien races invented artificial gravity. > If getting humans to another star system is a 100 on some "technology ability scale", we're a 2 which is not comparatively far ahead of say, poodles - who are probably at a 1. First off, poodles are at a zero. Second, if 10% of world GDP was dedicated to building an interstellar, multi-generation ark, we pretty much have the technology to do it right now. The technological problem is to reduce the cost to the point where the political will to do it can be summoned (probably around 0.01% of GDP). >Maybe they want to trade with us. Well, yeah, right. If you've gotten this far it's obvious we have no tech that would interest them. >How many years before we have a brain interface to Google? You'd know everything. We already have Google in our pockets. But instantly finding any quote by Darwin doesn't mean I understand the theory of evolution. 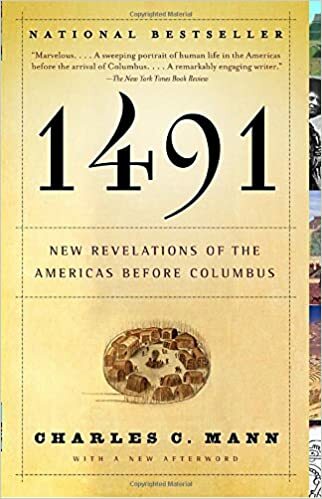 There's a lot of compelling theories in the book, 1491  about how forests were modified in ways in which I elude to, and how the population of the Americas was much, much higher than just 50 million, and how the were civilization much earlier than what we had first thought. If we just take east coast of Maryland, where the author grew up, the first explorers talk about villages that interconnected across the coastline, Chestnut and walnut trees everywhere, and established hunting grounds. Burning was an immensely useful tool to do this. Everyone had a fire starter. Later on, early settlers saw something drastically different - a dying off population from diseases brought by Europeans that they had no defense towards. And that is why our estimates on the population of the Americas, and the level of which they modified the land could be really off. What happened, from what I've read, is that initial contact put enough European disease into the population that the population and society collapsed; it was thus much easier for Europeans settling here to win. The Amazon was, allegedly, basically a garden at one point -- the natives the Spanish eventually encountered were just broken remains of a much larger civilization which had been successful and then disappeared. 1491 https://toptalkedbooks.com/amzn/1400032059 and Tastes of Paradise https://toptalkedbooks.com/amzn/067974438X are my personal faves. I'm talking about the Inkans, based on this well received book. https://toptalkedbooks.com/amzn/1400032059 Check it out, it's good. fun stuff, but also depressing. archeology seems to be an enormous amount of bs mixed with pottery shards. "what do you think this meant?" "it was most likely some kind of ceremonial, ritualistic thing." -- said every archeologist ever about everything. btw, anyone that has any interest in ancient american archeology needs to read 1491 .